Dead fish were washing up throughout the Peconic Estuary this week. In the second large die-off of marine life in recent weeks, thousands of dead menhaden, a bait fish known locally as bunker, began washing up on the shores of Flanders Bay and the Peconic River on the morning of May 29, and by May 31 reports of dead fish in the water have been coming in from as far east as New Suffolk on the North Fork. Dr. Christopher Gobler of Stony Brook Southampton’s marine science department told reporters that a “mahogany tide,” caused by the bloom of an algae known as Prorocetrum, had spread throughout the western portion of the bays, causing lethally low oxygen levels at night, when the algae consume oxygen when they can’t perform photosynthesis to meet their respiratory needs. Dead and badly mangled bunker continue to wash up throughout the Peconic Bay all week. Before 8 a.m. Sunday morning, New Suffolk resident Victoria Germaise reported to the Beacon that she saw “many, many dead fish along the shoreline with more floating in water” on her morning walk down to the bay. Dead and badly decomposing fish also littered bayside beaches along the Mattituck shore, and could still be seen by the thousands in Meetinghouse and Terry creeks. This algae bloom is a different bloom than the toxic red tide that caused the closure earlier this month of Meetinghouse Creek, Terry Creek, James Creek and the western half of Shinnecock Bay, which is a prime suspect in the deaths of hundreds of diamondback terrapin turtles and large numbers of bunker earlier in May. It is also a different type of algae than the bloom known as “rust tide,” caused by the algae Cochlodinium, which has been a frequent autumn visitor to East End waters. What these algae blooms do have in common, says Dr. Gobler, is that they are fed by excessive nitrogen making its way into ill-flushing water bodies. Both Southampton and Riverhead towns dispatched crews to clean up the dead fish. 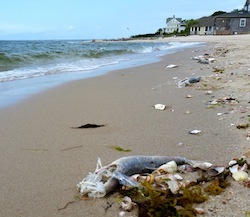 By Sunday, the smell of badly decomposing fish began to pervade the shoreline throughout the western Peconic Estuary. Late in the week, with the full moon bringing with it extra-high tides, many of the dead fish had been washed out to sea. But the smell lingered on throughout the estuary. These reports are starting to remind me of spring 1985. Let’s hope not. As for 1985. I had just returned from working five years in Chicago at the CBOE and the Board of Trade. Being between positions I took the spring & part of the summer as sort of personal sabbatical and went fishing with my Uncle Rob who lived on West Lane in Aquebogue. His small boat was kept at his friend, Mr Voss’s place on Meetinghouse Creek. We went out almost daily and witnessed the devastation of the brown tide firsthand. In the spring we were first told the fish were dying off as a result of a toxic infection of the bay water that was brought over from Narragansett Bay in RI. I can’t remember if this was just a rumor among fishing people or word from the County. The beautiful water of Peconic Bay was brown like weak coffee with cream. Then the county started to talk about Brown Tide and algae blooms and if the bay could get more cold water flow though tidal action things would definatly get better. Things got worse. By mid-summer bay-men were reporting the scallops and shellfish were dying off and we all hoped the bad news would level off and the bay cleanse itself out during the coming winter. The DEC said they had no reason to think the condition would persist the next year. Well it did and continued for many years after that with devastating effect. Only after many many years of hard work by dedicated people at places like Cedar Beach was the damage mitigated. I just have this feeling that things will get worse again before it gets better. Too many people so little room. Indeed, I knew back then in my heart what we know now scientifically but what most of us cannot face financially. Our land and waters need septic & run-off remediation now before it’s forever too late.